My only connection to the Greek metal scene were - until last year – Nightfall, Wastefall and On Thorns I Lay which is nothing compared to countries like Germany, Italy or the Northern European countries. Last year I discovered Battleroar (good) and Wolfcry (very good to excellent), bands that have awakened my interest on the Greek scene. This time it’s Elwing that I met and I must say from the get-go that this was a nice surprise. I haven’t listened to their debut album from 2002 (Immortal Stories), but their sophomore effort is a very interesting offer of true/power metal without any progressive/gothic or epic influences. A four piece act, with Sakis Koutsasis lead vocals and rhythm guitarist, an excellent talented Panagiotis Roumeliotis on lead guitars, producer and former member of popular band Nemesis on bass – Tasos Karapapazoglou and Alexis Mantirakis on drums, the Greeks sound is a honest display of raw power, melodic but aggressive riffing with excellent guitar solos and fast double bass pedal drumming. With war related lyrics and addictive power marches, the music sounds like a continuous warchant, atmosphere enhanced by the continuous adrenaline infusion from the rhythm section, galloping riffing and powerful vocal lines. Aside from the excellent rhythm riffs, Sakis Koutsasis has an excellent deep and powerful voice, sounding at times like a younger Pete Steele (Type O’Negative) but more like the excellent Rebellion’s mainman Michael Seifert. More, the majestic sound of the music and the deep tones remind me of the excellent 2004 Black Abyss album In Neo Noir (also fronted by Seifert). Sakis Koutsasis manages to top the instrumental part of the music with his powerful voice, with a good range and emotional performance. The classic power metal structured opener Marching To Glory has excellent melodic riffing, with power drumming and Maidenish dual guitar solos. Fast tracks like Stormlord (with his strong early-Sentenced flavor) or Fly Away with its heavy but melodic speed riffing are mixed with mid paced songs like At The Gates (good rhythm and up tempo vocal lines), Sons Of Revenge (with its almost Slayer-like heavy and aggressive rhythm riffing) or I’ll Live Forever (with its inspired guitar solos). The title track (War) is an instrumental piece, with the band sounding like a perfect-tuned machine, an excellent staccato intro, full blasting guitars, swapping leads, supported beautifully by the bass/drum section. Longest song on the album, also my favorite is the balladesque Blood On My Hands. True, it starts slow, with Sakis Koutsasis delivering his best vocal performance, clear and deep emotional vocals, supported by acoustic guitars but the song develops into a powerful slow paced (at first) true metal song, in the vein of Manowar’s Bridge Of Death or the classic Guyana with superbly structured guitar work, blasting bass lines and powerful drumming. Last song on the album, Lost Humanity is a Nemesis cover, a somewhat classic tune with a new approach. Overall, this is a very good album. True, it’s not very original; but the fact that the band has stripped of all ‘classic’ influences like keyboards, symphonic elements galore or complex operatic choirs, it has allowed (the band) to achieve a raw and unaltered power metal sound. 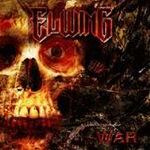 Fans of early Manowar, Grave Digger or Running Wild will love this album.